Our show over at the EPIC Voyagers Network will be diving into the world of Giants this week with researchers, authors and TV personalities, Hugh Newman and Jim Vieira. 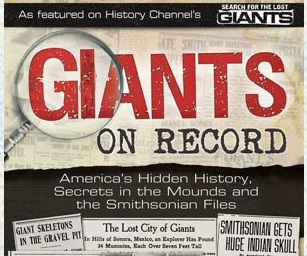 We get into their latest book project, Giants on Record, which covers not only hundreds of accounts of giant finds in archaeology, but also conspiracies that surround this subject. The subject of ancient giants is a complex tale, taking us to secret underground cities, vanished researchers, government cover-up and religious controversy. Having been on a ‘giant hunt’ with Discovery Channel over in the Georgian Republic this is of course a subject close to my own heart. 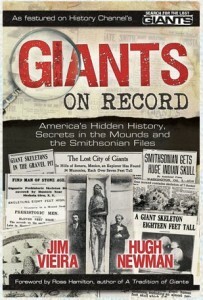 Check out the book’s homepage Giants on Record and the Amazon US Page / UK Page. Remember to Like their Facebook Page. We will be going into the book and then beyond into all areas of giant related thought! Join us at EPIC Voyagers for the broadcast of the interview on Monday 8th February via the Inception Radio Network 9pm ET or catch us again for a re-broadcast on Dark Matter Radio Friday 12th February 8pm ET. If you believe in Admiral Byrd and other human experiences of Giants in Inner Earth, where everything in gigantic….and some present mystery : no contacts exist between them and Galactic Federation….WHY ? why they exist in such way ? …there is some statement by Avatar Meher Baba in Sufism Reoriented : the first human beings, appeared within Creation, were about 5 metres tall, as highly advanced Civilisation, and the last humans at the End of Creation , will be a few inches tall……as experienced by some humans now, as “travellers entities ” from the future….to sum up : we have living examples of very beginning in our Inner Earth ! still WHY ? …to create “standard 6 foot ” entities across Creation , is not problem for Universal Mind Keepers : Vedic Avatars and Sadgurus….YES, Fantasy is something , what have NOT happened , YET..